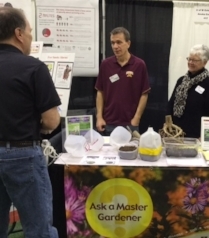 The term “Master Gardener” can be a little confusing to someone who is not familiar with the University of Minnesota Extension Master Gardener (EMG) Program. EMGs are volunteers trained by Extension educators and faculty to help connect research-based horticulture resources from the University of Minnesota to educate citizens on best practices in gardening while also addressing important issues in our environment. EMGs are not expected to be experts, but they are equipped with many resources to help guide consumers with helpful information. In 2016, there were 2,336 EMG volunteers who served over 142,00 hours in Minnesota. EMG volunteers come with many different skills and experiences. The common denominator is that they all join with the desire for life-long learning, the willingness to share with others what they learn, and for the camaraderie they have with other gardeners. There is an application and educational process that must be completed before someone can volunteer to become an EMG. Desirable candidates must have demonstrated gardening experience and computer/internet searching skills. Anyone who is interested in becoming an EMG must complete an application before October 2nd to be considered for the 2018 cohort. Once an applicant is accepted into the program they will take the EMG Core Course. This course is offered on select Fridays and Saturdays in January and February. Some of the modules that are taught include: fruits and vegetables, herbaceous plants, entomology, lawn care, integrated pest management, plant pathology, and tree and shrub care. Classes are offered at the Minnesota Landscape Arboretum with online options as well. The fee for the Core Course is $320 which covers the cost of materials and a background screening. Early Bird applicants will receive a $50 rebate (upon acceptance in the program and the completion of their internship) if their application is received by September 18, 2017. The EMG internship begins after the Core Course is completed. All new EMG Interns will be matched with experienced volunteers in their first year. There is a minimum volunteer requirement of 50 hours in the first year and 25 hours each year after that to maintain an active EMG status. It is not uncommon to find volunteers who have been in the program for over 10, or even 25, years. One EMG commented, “The program is wonderful. The people are amazing.” An EMG who is newer in the program stated, “This has been a wonderful experience and has opened up a whole new world for me and I am very glad I joined the program.” They all agree that even with years of gardening experience, they are amazed at how much they learn about horticulture from being in the program.